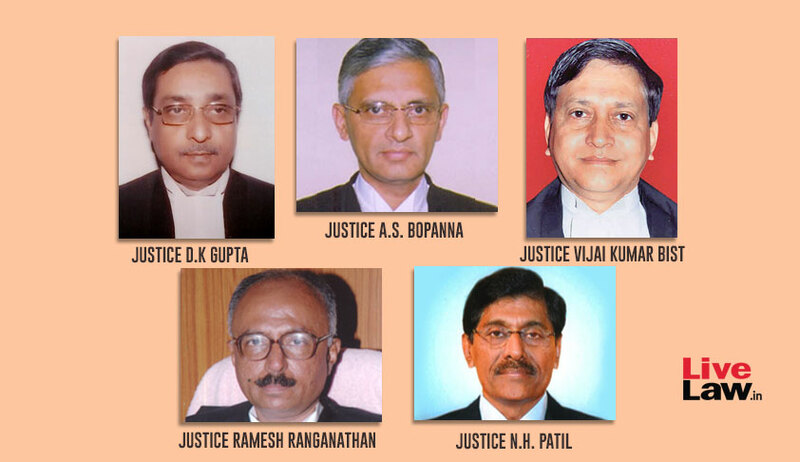 The Supreme Court collegium comprising Chief Justice of India Ranjan Gogoi, Justice MB Lokur and Justice Kurian Joseph on Tuesday recommended new Chief Justices for five high courts. The office of the Chief Justice of Uttarakhand High Court fell vacant consequent to the elevation of Justice KM Joseph as a Supreme Court judge. Justice Ramesh Ranganathan has now been recommended for the post. While making the recommendation, the collegium noted that there is only one Chief Justice originally hailing from the Telangana and Andhra Pradesh High Court at present, i.e. Chief Justice of Gujarat High Court Justice RS Reddy, who is set to retire in January, 2019. Justice Ranganathan has therefore been proposed to be appointed as the Chief Justice, keeping in view his “legitimate expectation”. The collegium has proposed appointment of Justice NH Patil as the Chief Justice of Bombay High Court. While making the recommendation, the collegium pointed out that the office of the Chief Justice of Bombay High Court has been lying vacant for quite some time, since the retirement of Justice Manjula Chellur in December last year. Furthermore, the resolution clarifies that it is invoking the provision of the Memorandum of Procedure (MoP) which provides for elevation of a puisne Judge as Chief Justice in his own High Court if he has one year or less to retire. This was after acknowledging the fact that Justice Patil hails from Bombay High Court and is due to retire in April 2019. Justice AS Bopanna has been proposed to be appointed as the Chief Justice of Gauhati High Court, a post which fell vacant upon retirement of Justice Ajit Singh. Justice Bopanna is a senior puisne judge from Karnataka High Court and has been functioning there since his elevation. The resolution also states that the collegium considered the names of Justice HG Ramesh and Justice Huluvadi G Ramesh, who also hail from Karnataka High Court and are senior to Justice Bopanna. It, however, considered Justice Bopanna suitable for the post. The collegium recommended appointment of Justice Vijai Kumar Bist as the Chief Justice of Sikkim High Court. The office of Chief Justice fell vacant after retirement of Justice SK Agnihotri. Justice Bist is the senior-most judge from Uttarakhand High Court and has been functioning in that high court since his elevation. The collegium further noted that there has been no Chief Justice from Uttarakhand High Court since the elevation of Justice PC Pant to the Supreme Court in August, 2014. The collegium recommended appointment of Justice DK Gupta as the Chief Justice of Calcutta High Court—a post which fell vacant recently upon retirement of Justice Jyotirmay Bhattacharya. Making the appointment, the collegium noted that at present, there is only one Chief Justice across High Courts who originally hails from the Calcutta High Court, despite it being one of the biggest High Courts. Similar to the reasons accorded for appointment of Chief Justice of Bombay High Court, the collegium invoked the same provisions of the MoP, as Justice Gupta hails from Calcutta High Court and is due to retire in December, 2018.